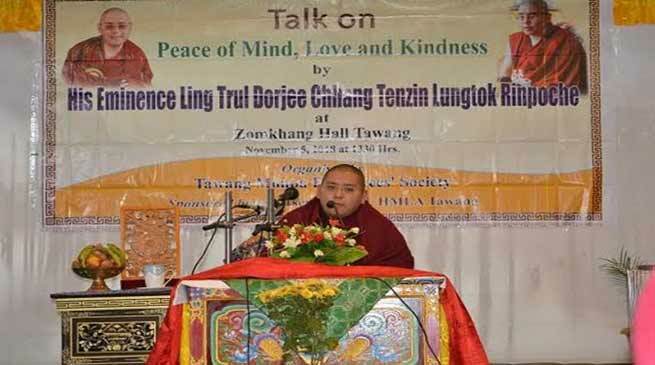 The 7th Yongzin Ling trul Dorjee Chhang Tenzin Lungtok Rinpoche gave a talk on the topic” Peace of mind Love and Kindness. This was organized by TMEs i.e Tawang monpa employees society and sponsored by MLA Tawang ,Tsering Tashi. Speaking on the topic Rinpoche said” Nobody wants suffering,we all desire for happiness and we have every right to be happy, but happiness cannot be achieved by material gains, we commit mistake by relying too much on gadgets. comparing the rural life with that of urban Rinpoche said, people living in rural areas have lesser access to these modern gadgets but they enjoy more peace of mind, to attain more peace of mind solution is inside ourselve we cannot find happiness in outside material things. The best ever gift parents can give to their children is education on good morality, kindness, love, and compassion towards fellow beings, and if these things we We are all interdependent on each other, we enjoy happiness because of others, Right from the beginning of this life we depend on others for our happiness, a child cannot survive without his mother, and happiness comes from giving it to others. The talk was attended by DC Tawang Sang Phuntsok, SP Tawang SS Kalsi,Head of the departments, college and school students at Zomkhang hall in Circuit house Tawang on 5th of November 2018.